C.X.K printing material industry co.,ltd , is a professional PS plate manufacture in Guangdong , China mainland, it has been specialized in this line for over 15 years, we provide ps plate with fine dots, long run-length , high image resolution in various sizes and thickness, don't hesitate to contact us now. 1. 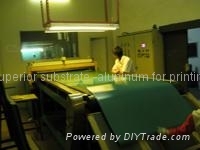 Vacuum ventilating layer With tiny ventilating grain layer on the surface, the vacuuming time during exposure can be greatly decreased, as well as preventing the proportion of tiny dots from exposuring to vague. 2. Water Receptive Layer Excellent water reception capability speeds up the ink-water balance procedure and helps to reduce water absorption during printing process. Superior water retaining capability do effectively prevents non-image areas of the plate from scumming and avoids paper from distortion. Consequently, the printing quality improved 3.. Multi Grain Layers Multi grain layers polish up water receptive property of the non-image areas on the plate. It increases the ink /water adjusting flexibility, make sure the developing performance of the tiny dots. It also strengthens the dots’ adsoption power to the coating layer, which can consequently extend the run-length of the plate. 4.. Anodic-Oxidized Layer A durable and strong oxidized surface formed after the anodic oxidation process on the aluminium material, which can help to prolong the run-length. This layer can also resists the corrosive effect done by the correction fluid.